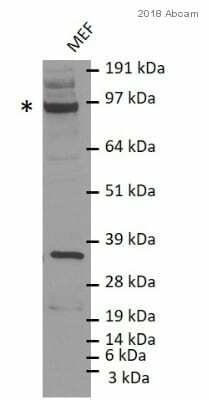 Knockout Tested Rabbit polyclonal KDM1 / LSD1 antibody. Validated in WB, IP, IHC, ChIP, ICC/IF and tested in Mouse, Human, Pig. Cited in 133 publication(s). Independently reviewed in 21 review(s). Synthetic peptide conjugated to KLH derived from within residues 800 to the C-terminus of Human LSD1. Our Abpromise guarantee covers the use of ab17721 in the following tested applications. WB Use a concentration of 1 µg/ml. Detects a band of approximately 105 kDa (predicted molecular weight: 93 kDa).Can be blocked with Human KDM1 / LSD1 peptide (ab17763). Lanes 1 - 4: Merged signal (red and green). Green - ab17721 observed at 110 kDa. Red - loading control, ab8245, observed at 37 kDa. ab17721 was shown to specifically react with KDMI/LSD1 in wild-type HAP1 cells. 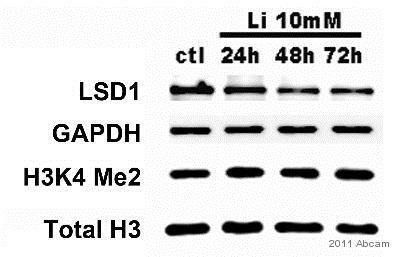 No band was observed when KDMI/LSD1 knockout samples were examined. ICC/IF image of ab17721 stained human HeLa cells. The cells were methanol fixed (5 min) and incubated with the antibody (ab17721, 1µg/ml) for 1h at room temperature. The secondary antibody (green) was Alexa Fluor® 488 goat anti-rabbit IgG (H+L) used at a 1/1000 dilution for 1h. Image-iTTM FX Signal Enhancer was used as the primary blocking agent, 5% BSA (in TBS-T) was used for all other blocking steps. DAPI was used to stain the cell nuclei (blue). 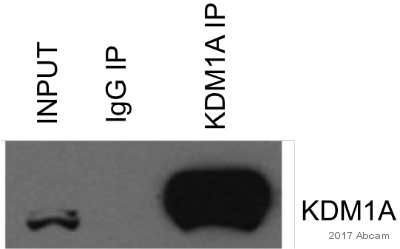 Alexa Fluor® 594 WGA was used to label plasma membranes (red). ab17721 staining LSD1 in the mouse c2c12 cell line by ICC/IF (Immunocytochemistry/immunofluorescence). Cells were fixed with paraformaldehyde, permeabilized with 0.5% Triton X-100 and blocked with 2% BSA for 1 hour at 25°C. Samples were incubated with primary antibody (1/200) for 1 hour at 25°C. 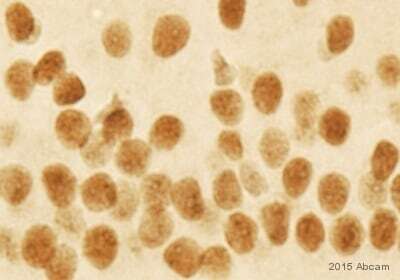 A diluted (1/2000) Alexa Fluor® 568-conjugated Goat anti-rabbit IgG polyclonal was used as the secondary antibody. ab17721 at a 1/100 dilution in cross-linking ChIP (using formaldehyde) with mouse liver tissue lysate. The protocol from Nguyen, T. T, et al. (2005) Mol. Cell. Biol. 25: 2147-2157 was followed. Semiquantitative PCR was used as the detection step. This image is courtesy of an Abreview by Michelle Barton. Human 293T cells fixed in 4% paraformaldehyde were immunostained with ab17721 (1/200) for LSD1 and detected using FITC labelled anti-rabbit (Green). Nuclear DNA is stained blue with DAPI. Publishing research using ab17721? Please let us know so that we can cite the reference in this datasheet.